One of the strange things about the Bible is that it contains so much about sacrificing. Animals are being slaughtered all the way through the Old Testament and then burned as sacrifices to God; and oftentimes after the blood is drained out it is sprinkled on the people, or spread on the doorpost, or handled in some other odd way according to some unusual ritual. If you have ever tried reading the Bible from cover to cover you know what I mean. By the time you get half way through Leviticus you have read just about all you want to read about sacrifices. The word sacrifice appears almost 200 times in the Bible. In Genesis 22 there is the strangest story of all, the story of God commanding Abraham to sacrifice his only son Isaac. This is the son who had been promised to Abraham and Sarah throughout their married life, and then was finally, miraculously born to them in their old age. Then, just when this child of the promise was about to become a man, God told Abraham to offer him up as a burnt offering. It was an outrageous command, contradicting God’s own Word and promise. But obediently, Abraham prepared to sacrifice his own son. He was stopped by an angel of God only at the last moment. And all this talk of sacrifice is not only in the Old Testament, but continues throughout the New Testament as well. In fact, the central event of the New Testament is the death of Jesus on the cross, as a sacrifice, given for the forgiveness of our sins. What is going on here? Why is all this sacrificing necessary? We are by now used to the image of the cross on which Jesus died. Even though it was an instrument of public execution, not unlike a hangman’s noose, we have turned that cross into a piece of jewelry. Thus, we have tamed its force and made it appear acceptable and respectable. But all this talk of sacrifice in the Bible still seems very strange to us. But should this really be so strange? Our worship rituals are no longer filled with animals being killed, and blood sprinkled on those worshiping, and burning flesh on altars, but we still do know all about sacrifice, don’t we? Our lives begin with, are bound up in, and end with countless sacrifices. We would not be here if not for the sacrifices of many others, and most of you can think of people who are right now, or in the past, or in the future, will depend on you and on the sacrifices you are willing to make for them. It starts at the very beginning. As a parent, you bring that first little baby home from the hospital, and you find out right away what you have sacrificed. Should we start with a full night’s rest? Add to that being on duty 24 hours a day, always responsible for the well-being of a helpless new life. And this will go on for years. You have, quite completely, sacrificed your freedom. And babies cost money, so you have made a huge financial commitment and sacrifice. Babies get sick, and you worry; you have sacrificed the ease of only having to worry about yourself. I could go on. And it never ends. You feel a burden and a care for that child for the rest of your life. I remember visiting an 80-year old man in the hospital. He had a stroke, and would now have to go to a nursing home. There by his hospital bed, holding his hand, crying with him and comforting him, was his 101 year-old mother who had come to see him. She wasn’t living in a nursing home, but had the strength to live with her 77 year-old daughter; and she was still worried about her kids. Having a baby means a life-long burden and sacrifice. Fast-forward to the end of life. When you were a baby, you needed lots of care, and your parents sacrificed much for you. And if you live long enough, you will also need lots of care, and someone, perhaps your children or other loved ones, will have to make sacrifices for you; taking you to the doctor, helping you with your finances, helping you move into an apartment, sitting by you in the hospital, and so on. That 101 year-old mother I referred to a moment ago, still worried about her son, was herself being cared for by her 77-year-old daughter who was making some significant sacrifices for her. From beginning to end and all the while in between, life is filled with sacrifices for others and for ourselves. In school, if you want to make the team or make the honor roll, you will have to make sacrifices to work harder. If you want to get ahead on the job, you will have to make some sacrifices. If you want to lose weight or get in shape, you have to make sacrifices. And then there those ultimate sacrifices, and, if you enjoy the prosperity and freedom that we have living in this nation, you have to have a deep gratitude for the many lives that have been sacrificed over the years to win and protect that freedom. So why should we be surprised that the Bible is so full of talk of sacrifice? Our lives with each other are filled with sacrifices for each other. Should it surprise us that our lives before God should also have an element of sacrifice? And who are we to define what that relationship should look like or consist of? The blood sacrifices of the Old Testament do sound strange to us, but even back then, all of those animal sacrifices were only a symbol of something far greater going on. In the New Testament the animal sacrifices were abandoned, but that ‘something greater’ was still there, and was taken care of in another way. That ‘something greater’ that is behind all this is that things are not right between us and God. Our sinful disobedience has darkened and saddened the good world that God created, and God demands that things be made right again. And righting a wrong, or healing a wound, or restoring a broken relationship always takes a sacrifice. Someone must be willing to apologize, someone must be willing to make amends, and someone must be willing to forgive. The burden should be on us because we are the ones who have broken the relationship, but the story of the Bible is that God has taken the burden upon himself, most perfectly and completely by coming to earth in person in Jesus of Nazareth. His death on the cross was the sacrifice that paid the price that healed the relationship with God. Our little minds will never comprehend exactly how this all works, but we can understand what it means to make a sacrifice, and that is what Jesus did for us. It is a strange story in Genesis 22 where God tells Abraham to sacrifice his only son Isaac. What kind of God is this that would demand such a sacrifice? Why would God tell somebody to sacrifice the child whose life, God Himself said, was to be the hope of the world? None of those questions are answered in the story. But the story does not end with the sacrifice of Isaac, the boy, the son. Rather, the story ends with God providing the sacrifice. 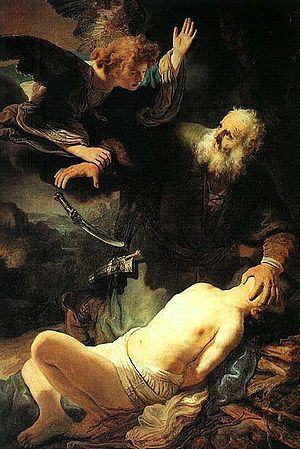 God has as angel stop Abraham as the knife is ready to descend into Isaac’s body, and then the angel shows Abraham a ram caught in a thicket. God provides the sacrifice, there for Abraham, and later on the cross for the sins of the whole world. Our daily sacrifices are made for each other, but only Christ’s sacrifice on the cross restores our relationship with God. Even the great thinker and writer C. S. Lewis could not comprehend it all, but he pointed out that what the Bible says is that we are not asked to fully understand it, but simply to believe it. Just believe in that Jesus and the sacrifice he made for you, accept it, and receive it as the free gift that it is, and it is yours, and it will save you, now and forever.